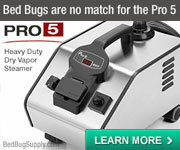 Anyone used Pro Service Pest Control? 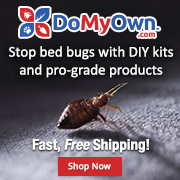 Anyone Use AAA Superior Pest Control? Hi. I'm new to this forum; I feel like I'm studying for a second PhD in bed bugs. I've been reading everything on this site for the last two days. I recently discovered I have bed bugs in my apartment in Brooklyn. Not sure how bad the problem is yet. I left Brooklyn for the holidays last Sunday, worried because these strange bites my girlfriend had been getting whenever she stayed at my place were getting more frequent; at first they were just single bites, but the weekend I left she discovered multiple bites. I myself wasn't finding any bites--until the day I left I found one on my side. Then I realized a couple of other marks on my foot were most likely bed bug bites as well. I got paranoid and started researching online; she started getting paranoid and talked to her mom, who'd had bed bugs before; anyway, two days after I left she went over to my place to strip the linens off my bed and vacuum and, voila, she found a big bed bug and bagged it as proof. I contacted my landlord and explained the situation. He's a good guy and willing to pay for extermination, but a) he's never dealt with this problem before and doesn't seem fully aware of how serious and potentially costly an infestation can be; and b) he wants to use what seems to be a lower-cost pest control company. Obviously there are a lot of scams out there and I don't think he should be paying hundreds of dollars for dogs that aren't even reliable, but I'm wondering if anyone has ever heard of or used Pro Service Pest Control in Brooklyn? Their website doesn't say much. What I do know is that they're offering a 6-month guarantee for their service, which seems impressive. They're coming Saturday morning to inspect; if we decide to hire them for treatment, they don't charge for the inspection. Follow-up treatments are built into the treatment plan. All of this sounds good. What worries me, though--and, mind you, I haven't spoken to any representative at Pro Service yet--is that apparently they told my landlord they'd be able to treat my apartment the same day they come to inspect. They'd "help" me prep the place for treatment. They didn't have any specific instructions for me to prep my place except to wash my linens. From everything I've read on this board, I know that the prep has got to be more rigorous than that--even for "conservative" PCOs like Killer Queen. In fact, I read Killer Queen's prep pdf and was surprised that even he had so many prepping steps. But the thoroughness makes sense to me. Anyway, I live in Brooklyn and really would just like to hire Killer Queen, but it's not my call because I'm not paying for the extermination. I'm going to watch this inspection like a hawk on Saturday and see if it seems fishy to me; if it does, I'm going to nix the treatment and have a talk with my landlord. I'm considering even helping to pay for the services of Killer Queen--working out some kind of payment deal with my landlord if he balks at the price. Sorry for the long post. Basically my ramblings boil down to a few questions: 1) Has anyone used Pro Service? 2) What are warning signs I should look for during the inspection that would tell me not to use them? 3) Should I just try and convince my landlord to hire Killer Queen--and if he doesn't want to pay for the services, pay for some of it myself? 4) Is it smarter for me to act quickly in trying to exterminate bed bugs by using Pro Service now, or wait until I can make an appointment with Killer Queen? I ask this because I'm assuming KQ wouldn't be able to inspect my place within the next week, based on his popularity. From what I've read here, I know sitting on a bed bug problem is not good, but I also know that a bad PCO can make a problem worse. I was in a similar position -- call in an outside PCO or use the one the building had under contract. Like yourself, I questioned the competency of the building's PCO, so what I did was to call anonymously and tried to find out as much about their treatment program as possible. You might do the same. The "inspect and treat in one day" routine does not sound most desirable as prep is the cornerstone of a successful treatment. So unless your place is uncluttered and/or the infestation is contained in a small and defined area, I'd be hesitant to treat the same day as the inspection. And not to sound paranoid, but the "free" inspection only if they treat does leave a big incentive to treat that day since the men/women are already there. In my case, the PCO did require a prep and had what I'd consider an average treatment program using the right chemicals. Not ideal, but my plan was to go with him because especially living in a multi-unit building I wanted the landlord to be fully responsible for getting rid of the problem. My concern was that if I brought in my own PCO and the problem persisted, that the landlord would then blame it on me, i.e. "you should have used my PCO". Sounds like you have a better relationship with your landlord, so maybe that would not be an issue. So that aside, I'd go with someone like KillerQueen for two reasons. First, I'd trust his inspection more and second, I like the thorough treatment process he outlines that combines both steam and chemicals. I don't think a week one way or the other should make much of a difference when weighed against what appears to be a hasty treatment plan. Thanks, Richard. Helpful thoughts. I called up Pro Service today and felt somewhat better when they passed Sean's checklist for trustworthy PCOs in the FAQs. They offer a 6-month guarantee, they have liability insurance, they do at least two treatments (and more if necessary), and apparently they take 1-2 hours to do the inspection/treatment. I got all this info from the very "confident" receptionist who'd been working there for three years. I suppose the best part about this company is the guarantee. I asked about prep and she said for a low-level infestation, it was best to wait for the PCO to check out my place and then he'd instruct me what to do. It's possible he'll tell me to prep so he can come back a different day--there's no mandatory same-day treatment. Of course the receptionist said to strip and wash my linens. But nothing about unpacking dressers and shelves and bagging stuff. I plan to do as much of this as I can on my own anyway in my bedroom, to make sure the PCO can do the best job possible. The question is whether I have a low-level infestation or not. I'm pretty sure this is the case, but I'm not a bed bug expert. My girlfriend and I only found bites over the last couple of weeks, and not very many. What seems to be a good sign is that my gf has not had any new bites since I left--she's been staying at her place all week. I'm hoping this means she didn't bring any bugs back with her, which I believe would be a sign that my infestation is not that big yet? Everything Pro Service told me over the phone sounded good except for the treatment they use. I asked what they do. The receptionist said they use a pesticide called EcoExempt KO. She sounded very confident about this product--"there is no way the bugs can survive this," etc. etc, and "you have a guarantee." Apparently Pro Service does not usually go back to a unit more than twice. 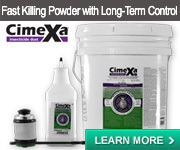 But I googled EcoExempt KO and immediately found the forum on this site where Killer Queen pronounced this pesticide essentially useless. Contact killer with no residual effect. I called back to see if Pro Service uses any other methods to exterminate besides EcoExempt, and the lady said no. No steaming or dusting. Again, perhaps the actual PCO will do more than she knows, but I'm not getting up my expectations. I'm willing to wait and see what this inspection and treatment is like. If the PCO only wants to use this chemical and starts applying it indiscriminately, I think I'm going to nix the treatment and confer with my landlord. I've already sent him a long email detailing my concerns. I provided him with links to this forum that explain how use of this chemical might drive bugs out of my bedroom--but into other rooms in my apt or, more disastrously, the two other upstairs units and the basement. I don't know if Pro Service's "guarantee" covers that. They are, however, planning to inspect and treat the hallways of the building and maybe some other places. We'll see. Anyone with any new thoughts on EcoExempt KO? Will it work for a low-level infestation? How might I stay on the PCO to ensure he does the best possible job with this product? Or is it just too risky to let this guy use EcoExempt (on its own) at all? Should I just nix the treatment if this is what he wants to do? I need answers by Saturday morning, 9 AM EST! I am a professional PCO from San Francisco. I will not reveal my company name because I am just trying to help people out there with bedbug issues. You had many questions so answer a few EcoExempt was probably going to be used because it is a green product and safe to use on mostly anything. As far as it actually killing the bedbugs, it will only kill the bed bugs that he actually hits. So if he misses a bedbug then the bedbug will go untreated. There is no residual as you already discovered in doing your own research. In order to do a good job that company would need to use a IGR Insect Growth Regulator to stop the adult from laying any more eggs. I would recommend "Gentrol". The next thing would be to use a residual product that would be used around the bed frame, baseboards, closets, furniture, nightstand, etc... 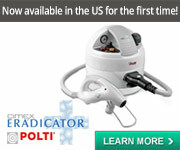 This will kill the bedbug even after the product has dried up. I would recommend to use "Phantom". Warning: Phantom cannot be used on the mattress!! So on the mattress you could probably use the EcoExempt product, I like to use "Bedlam" on the mattress. You cannot use a residual product on any mattress. As far as the company coming out to do an inspection, It would probably be a waste of time because you already know you have bedbugs. 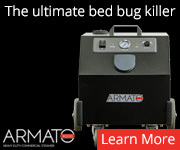 When I treat a unit for bedbugs I go in thinking theres a big infestation and that the bedbug can be hiding anywhere. So if this company just treated your mattress then they might be missing other areas that might harbor bedbugs. If they help you bag up your items then they will probably charge you for that service. You could probably bag up your own items. 1. Empty all drawers & cabinets in infested rooms. 2. Remove all items from shelves. 4. Remove all storage & clutter from underneath furniture. 5. Furniture will be fully inspected. Make sure to move any furniture 12" from the walls so that treatment and inspection can be done. Sofas need to be turned forward for inspection underneath & apply treatment if needed. 6. Remove birds, dogs, cats or any other pets. For aquariums, make sure to disconnect the pump and cover the top with a towel. 1. Remove all clothing from closets & drawers. 2. Remove all bedding, including the mattress cover if any. 3. Place clothes & bedding in sealed plastic bags until they are laundered according to the following instructions: a.) Wash clothes & bedding in hot water (120 °F) if laundry instructions permit. b.) Dry clothes & bedding on hot setting (120 °F) if laundry instructions permit. IMPORTANT: dry cleaning may be necessary if laundry instructions require cold or warm water settings. 4. SEAL laundered clothes & linens in clean plastic bags or containers until bedbugs infestation is brought under control. 1. Vacuum the infested mattress, (all sides, top & bottom), remove it from the bed frame and stand it on its side for inspection & treatment. 2. Vacuum the box spring, (all sides, top and bottom), and stand it on its side for inspection and treatment. 3. Remove the headboard & footboard and vacuum all cracks & crevices. 4. Vacuum the floor and concentrate on the area where the carpet meets the wall. 5. After all vacuuming, remove the vacuum bag immediately and place it in a sealed plastic bag for disposal. Those are the main requirements. Just make sure to wash all your clothes and when you wash your clothes make sure that you don't put your clean clothes into the same bag as what you brought them in. We always require 3 treatments. 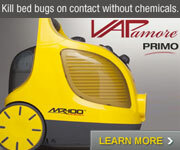 Also ask the pest company to place out bedbug monitors. 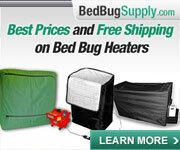 see if you can purchase some bedbug monitors. Here is a link to the monitors we use. I hope all the info I provided helped. Thanks for the lengthy, detailed reply. So far the situation seems to be okay. The guy from Pro Service came and used a combination of Bedlam and EcoExempt KO and I think Sign-Off too? Not sure about the last one. He used Bedlam to treat the mattress and all the fabric furniture in my living room. Not sure exactly what he used the Eco for. Strangely, there is some chemical still on the bookshelves in my living room that is not drying--does anyone have any idea what that is? I don't think I had (or have, knock on wood) a major infestation. No more bedbugs or signs of bedbugs were found during the inspection/treatment or while I was cleaning and vacuuming. I've sealed most of my stuff in plastic bags--this is taking a while as I have a LOT of stuff, particularly clothes that cannot be laundered on hot--and have been good about taking clothes off upon entering the house and putting them back on when I leave. I have a hallway outside my apartment that I'm using as a kind of quarantine where I have everything bagged up. Looks like an art installation. Yesterday I finally got my mattress covers--so nice! They cost $116 each, but they seem worth it. 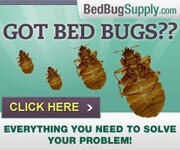 Not only are they bedbug-proof, but they're silky to the touch. Anyway, my girlfriend and I put those on and slept in the bed last night and didn't find any new bites this morning. I slept in the bed the previous night without the mattress covers and didn't find any bites. Although later on that night I noticed a couple of reddish spots on my back after I showered--not sure yet if those are just zits are new bites. In the winter my skin really acts up. The best news is that my girlfriend--who is really reactive to these bites--has not had any new ones since I left for Thanksgiving a couple of weeks ago. And when I came back, I stayed at her place for a few days--after fully quarantining myself by taking a shower before I left my place and bagging up all my clothes in her shower when I got to her place and then turning the water on hot. I essentially just walked around her place in my clean underwear. I did this for a few days until I was able to wash some pajama pants on hot and bring them over. I didn't get any new bites at her place. The PCO from Pro Service didn't think I had a big problem; in fact, he didn't really see signs of anything at all, aside from the bagged up little bug I showed him. He kept saying maybe my girlfriend brought the bug in, that this was a "traffic bug." Who knows. Maybe we got lucky and she killed the only bug there was. But that seems unlikely, right? Is there ever just one bug? I'm hoping that the treatment killed any other nymphs and that the mattress encasements are now suffocating the rest of them. [quote]I like to use "Bedlam" on the mattress. You cannot use a residual product on any mattress. I thought bedlam was a residual? Yes, I was told it was a residual. And the can says it has an effect for up to two weeks. But maybe that's just on wood, ceramics, and carpets? Doesn't say anything about fabrics such as a mattress. Who knows. Im gonna have to look into that.